Let's face it. The global economy is in a crunch and we all want to get the best value money can buy. Have you been toying with the idea of hiring a notary instead of a qualified immigration attorney? There are more than 4.5 million notaries in the U.S alone. This is a staggering figure. Where do you start when separating the chaff from the wheat? How do you know if the notary services you're considering are the real deal? Immigration law in the United States is one of the most complex and least understood areas of the judicial system. This is why you want a professional to handle your immigration case right off the bat. Notary services, or "notarios" as they're commonly referred to in the Hispanic community, serve in their capacity as state agents. Their primary role is to bear witness when important documents are being signed and to administer oaths. State laws require a notary to be a legal citizen living in the U.S. It's easy for new immigrants relocating to the U.S to get confused on the scope of services a notary can provide. Throw in the fear of being in a new country, language barrier, confusion, panic and you have the perfect mix for deceptive tactics to thrive. This confusion rears its ugly head as a result of the existing language barrier. Back in their home country, immigrants identify with the term "notario" as a lawyer who can handle a variety of legal issues. In the U.S, this is not the case and a notario is simply a notary with no authority to offer legal advice. Some countries require notary service providers to be lawyers. It is not a requirement for notaries in the U.S to have a legal background. Surprisingly, taking a 6-month course and passing a 45-minute exam is all it takes to become a certified notary in the United States. Considering their limited expertise, notary services have no legal authority to advise you on your immigration case. If a notary is caught giving legal advice to a client in an immigration case, they risk being charged and convicted of notarial misconduct. They are licensed by the state and required to perform their duties in accordance with the local laws. You can find notary services in all states in the U.S. Just click here to find a notary near me. Just so we're clear, notaries are not licensed attorneys. It is illegal for them to give any form of legal advice. Here is a quick checklist of services that a notary can offer in exchange for monetary compensation. Filling out all the details on the immigration form based on the information provided by the applicant. Obtaining all the necessary documentation needed for immigration cases. Making copies of all immigration documents. Delivering all immigration paperwork, duly filled, to the relevant office once the immigrant/applicant has given the go ahead. Notaries have no legal authority to represent you in court proceedings. You should always counter-check the accuracy of the information in your immigration file before appending your signature. Once you put down your signature on any immigration document, you have given an assurance that all the information provided is true. If a notary mistakenly fills in incorrect information about a case, this can lead to the termination of the case and the subsequent deportation of the defendant. Don’t expect the small Bond required of all notaries to cover all the damages caused by a notary’s malpractice in an immigration case. This fact alone should be a caution to all notaries as well as those seeking immigration services. Notaries are not licensed to practice law in any capacity. 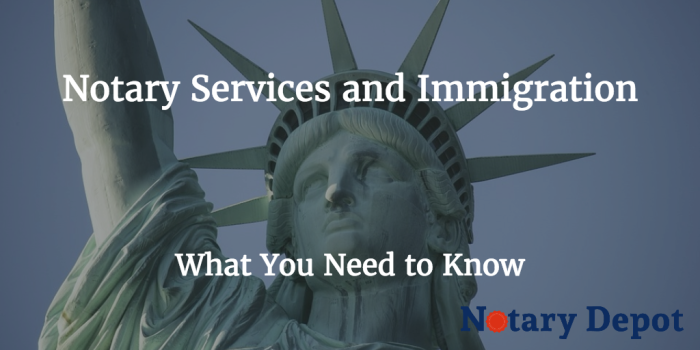 You'll definitely have boatloads of questions to ask your notary about the immigration process in the U.S. It's very important for notaries not to overstep their mandate when addressing these concerns. Where do notaries draw the line? When does it become illegal for them to offer help to immigrants in need? Below are a few examples showing the kind of advice that can get a notary in trouble with the law. When a notary advises an applicant on the best way to answer a question on an immigration form, he/she is practicing law illegally. A notary is in violation of state laws when he/she gives advice on the best strategy to use in an immigration case. Taking part in legal negotiations on behalf of the client. Recommending which form to use for a particular transaction. Explaining the consequences of signing a particular immigration form. Simply put. A notary who exercises judgment or gives direction is illegally practicing law without a license. Every state in the U.S has a unique set of laws governing the conduct of public notaries. The underlying principle, however, is still the same. Notaries are not authorized by law to execute any legal duties. Don't forget to browse through our listed notary agents on your way out. We have a comprehensive list of notaries in all states.